The Swedish Maritime Administration (SMA) has procured SSPA to support them with technical expertise in a prestudy regarding a new fleet of icebreakers. The SMA is responsible for the Swedish icebreaking, and owns five icebreakers. The icebreakers and their activities are an important feature of the Swedish infrastructure, to function in the winter and to facilitate the ports to be open all year round. Icebreakers provide merchant ship assistance by monitoring, directing, leading and towing. During part of the year, the icebreakers are not allocated to their "regular duties", they are often assigned to research projects. The existing Swedish icebreakers, about 40 years old, plans to be replaced by the next generation within a period of ten to fifteen years. - “The project assigned to SSPA is divided into two sub-projects; the design project will last to 2018 and the construction project is expected to begin in 2019, if it will be approved by the government”, says Magnus Forsberg, SSPA. The design project, that recently started, contains a concept phase including analysis and decisions regarding the possible adaptation of alternative activities. The development of an outline technical specification for the procurement of a complete basic design with a full technical specification from a design consultant has already begun. The next step, which will be decided later on, will be to award the building contract to a shipyard. SSPA’s part will be to support SMA during the process with regard to the results from the initial concept phase, innovations regarding hull, propulsion, fuel, equipment, etc. The work involves, among other things dialogues with classification societies and authorities and other experts in the field. 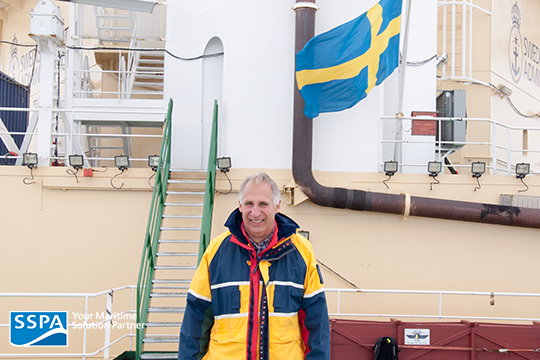 Anders Broberg, Senior Consultant at SSPA, visits the icebreaker Oden. Oden was delivered by Götaverken Arendal shipyard to the SMA in 1989. Oden has since then made many expeditions to the Arctic and Antarctic.